PHILADELPHIA (WPVI) -- Congratulations are in order for Philadelphia Eagles safety Rodney McLeod and his new fiancee! McLeod proposed to his girlfriend Erika Lee in New York City on Friday and she said yes. "She said YES!! I'm excited to begin this journey with this beautiful woman. #bigrings," McLeod posted on social media Sunday night. McLeod retold to Yahoo Lifestyle the romantic tale of the how two met in 2009 when he was 19 and she was 18. "I thought she gave me the wrong [phone] number in college. I'm thinking she just gave me a false number because she didn't want to talk to me," McLeod said. "I saw her again, and I'm like, 'That's messed up. If you didn't want to talk to me, you just could have told me.'" In fact, Lee gave him the right digits. He just texted the wrong number. Now in 2018, just weeks after winning the Super Bowl with his teammates, McLeod was ready to pop the question. Patriots wide receiver Brandin Cooks (14) tries to leap over Eagles safety Rodney McLeod (23) in the second quarter of Super Bowl 52, Feb. 4, 2018, in Minneapolis. "I've got to go out there and execute. I'm going to just say what's in my heart. I know she's going to be super-emotional. I'm just hoping it doesn't rain!" McLeod told Yahoo a couple days before the proposal. McLeod was able to bring family members in to surprise Lee and help him ask the question. They held up "Remember when..." signs including ""Remember when... I thought you gave me the wrong number." Then he got down on one knee and asked Lee. McLeod picked up the engagement ring from a Philadelphia jeweler, the day after winning the Super Bowl. Now, both McLeod and Lee have a ring of their own. Read the full story of their engagement on Yahoo Lifestyle. Earlier this month, Eagles quarterback Carson Wentz proposed to his girlfriend Maddie. Watch the report from Action News at 4:30 p.m. on February 6, 2018. 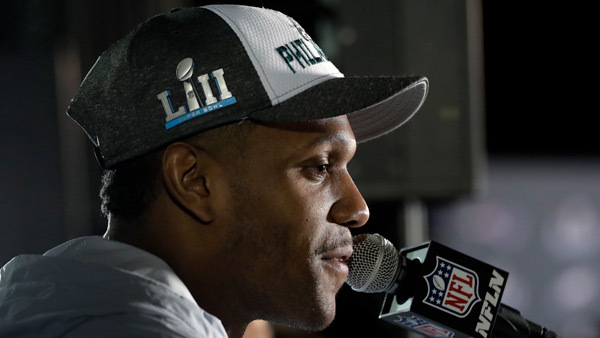 The announcement came just two days after the Eagles' historic Super Bowl victory over the New England Patriots. Carson wrote: "She said YES! And now Maddie and I both got us a ring can't wait to marry my best friend! God is doing some amazing things and I can't thank him enough!"